A TSA officer loads in the tall stock for a routine explosives scan. CHICAGO—In its ongoing effort to cut transportation costs and boost profits, United Airlines announced Tuesday that it was exploring the feasibility of herding them into planes and stacking them like cordwood from floor to ceiling. “If a 747's maximum takeoff weight is 875,000 pounds, then we should be packing that plane with 875,000 pounds,” Tilton added. In-flight amenities will still include the breathable pressurized air United is known for. According to a press release, the company estimates that the new policy of simply arranging them in a towering mound will allow it to sell approximately 20 times more tickets per flight. In addition, executives claimed they would be able to eliminate the unnecessary cost of in-flight magazines, chairs, seat belts, blankets, bathrooms, headphones, and oxygen masks. United officials said they conducted a test run in September during which they sent a flight from San Francisco to Denver and really jammed them all in there as hard as they could. Analysts found that 98 percent of them arrived safely at the correct destination, and of those who were lost or damaged, nearly all were eventually located. Engineers at the airline confirmed they are continuing to experiment with stacking patterns and ways to organize them in the cabin and cargo hold, putting an emphasis on minimizing wasted space and maximizing the stability of piles so that they do not fall over. Brown said engineers have also explored the advantages of different loading procedures, such as driving them down the aisle like cattle, or just putting them on their sides and rolling them in. Researchers eventually concluded that the most efficient system is to wheel them out to the tarmac on luggage carts so baggage handlers can just grab them and chuck them onto conveyor belts. Sources confirmed that early on in the trials, engineers abandoned the so-called “criss-cross” stacking method—in which each new level of them is arranged perpendicular to the previous one—as the resulting piles were not as densely packed as possible. The research also determined that bundling four or five of them together and securing them with straps or duct tape is far too time-consuming and cost-prohibitive. According to senior vice president Alexandria Marren, the new loading procedure is expected to greatly reduce boarding times, and the check-in process will be streamlined as the airline takes up labeling them with special barcodes for quick electronic scanning. United also plans to introduce several new in-flight amenities, including a sprinkler system that will cool them off every 30 minutes and grated floors through which the waste products can drain. 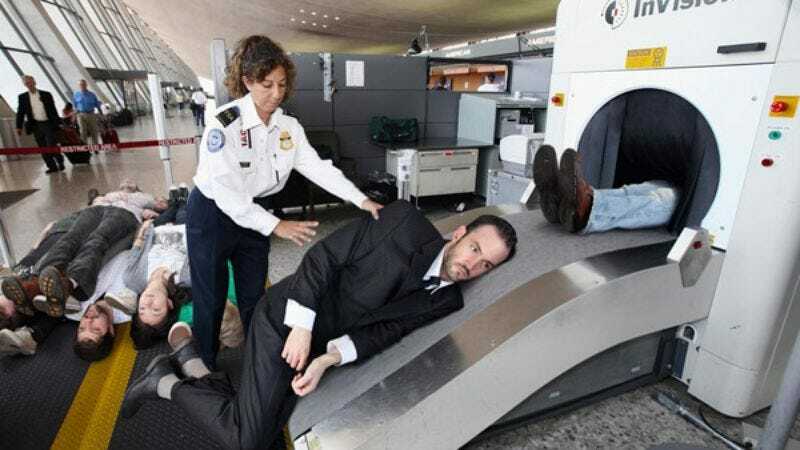 Acknowledging concerns that some of them suffer from a fear of flying, the airline announced that it will soon begin forcibly tranquilizing all of them upon arrival at the check-in gate and attaching a small $45 sedation surcharge.